Camping, hiking, cycling, and even business travel. Rooted within the mind of the traveler is the urge to explore, to strive forward, equipped not only to survive, but to thrive. For me long distance bicycle touring exemplifies this concept. Pushing out on a week-long camping trip, my saddlebags packed with clothing, lightweight tent, folding camp stove, cooking gear, rain gear, repair kit and instant Starbucks coffee (I’m not an animal). Gear must be sturdy, functional, versatile, and, most important, really, really, cool. What makes it cool is that beautiful blend of form and function. A camp chair assembled from my sleeping pad that can support my 200-pound frame, yet fold down next to nothing. It’s the modern, lightweight version of the handsome furniture Christopher Schwarz explores in his extensively researched book, Campaign Furniture. Campaign furniture, also called camp, barracks or patent furniture, is primarily defined by the British expedition forces of the 19th century. Large forces sent out to manage the vast Empire colonies required furniture that was sturdy, rugged, moveable, while still maintaining elegance. My first sight of this style of furniture came from old photographs of Earnest Hemingway on his many African safaris, a time in the fabled authors life where hunting trips always included such camp luxuries as a folding writing desk. Even Indiana Jones didn’t venture forth on an archaeological expedition without a caravan of trucks packed with crated camp furniture. Only mistake was taking Shia LaBeouf with him. Imagine the skill necessary to construct a five drawer chest that not only survives a long, brutal sea voyage, but then continues to serve purpose through heavy handling, harsh climates, and frequent moves. Beyond this utilitarian necessity campaign furniture also found an audience with city dwellers who valued its small footprint and ability to fold out of the way when no longer needed. 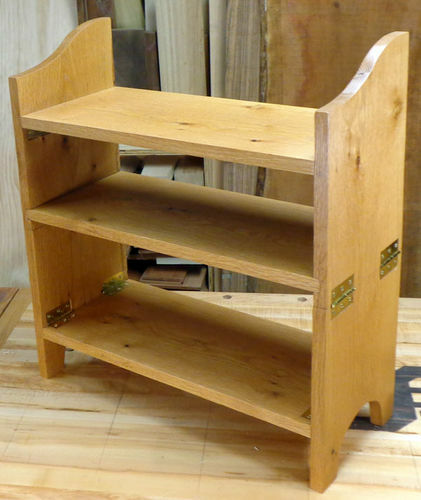 Chris does an amazing job researching and replicating the solid craft of woodworking that went into this – as he mentions – often overlooked furniture style. The author creates a cohesive narrative including the historical perspective as well joinery techniques, some particular to campaign furniture others slight modifications of classic methods, and detailed designs for the audience to pursue. A word of caution; these designs are not for the faint of heart. Even though Chris takes the time to discuss how to cut half-blind dovetails, his emphasis is not on teaching that particular skill. Other sources, such as Paul Seller’s Working Wood 1 & 2 (reviewed on my website), can better provide this level of instruction. I would not make this my first book on woodworking. That’s not to say that his designs lack details; on the contrary the author includes an abundance of clear photographs, accurate drawings, and specific part lists to allow the average woodworker to try their hand at campaign furniture. In terms of craft, most will know of Christopher Schwarz from his many books and articles on hand tools. In Campaign Furniture the reader will see both hand and machine work being done, what some refer to as “hybrid” or “blended” woodworking. It happens to be my preferred method. What makes this book so valuable is Chris’s considerable writing and woodworking skills. The text is simply a great read. Engaging, thought provoking, humorous, and informative. I discovered this book while searching out suitable designs for an early 1800’s travelling liquor case based on a photograph from a magazine. The first problem I encountered was determining what this style of furniture was commonly called, the second was dealing with the scant amount of literature available. Mr. Schwarz is definitely the authority on this subject. The author gets down into the fascinating details, such as selection of wood, in particular teak and camphor, that travelers sought to withstand the harsh demands of tropical weather. At the same he offers reasonable alternatives, oak and walnut, for the modern woodworking using more available (and by that I mean cheap) domestic woods. Chris pulls material from multiple sources that he compiled over many years, even reproducing original company ads that include such trivia as price and wood options. As much as possible the author stays true to the original design, while still offering modern flourishes to aid in construction. 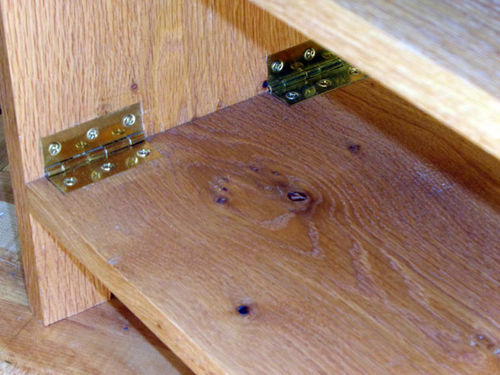 For a folding writing desk Mr. Schwarz substitutes wooden cleats for the more difficult brass pins, which would require the woodworker to do some metalwork. When it came time for my first piece of furniture from his book I wanted a project that would challenge my skills, stretch my imagination, and result in a thing of beauty to be admired for the years to come. Problem was that all looked pretty darn hard so finally settled on what looked the easiest one; a small, folding bookcase. Knew there would be problems since Chris stated it was an easy thing to build. That’s mostly true because the only joinery on this project is hinges; not so true since there are twelve of them to install. Two of the twelve hinges needed. My first challenge was buying the hinges, for one the author failed to mention the size he used, and the other was simply the cost. Box builders know that the price of hinges vary exponentially. At the top of the line are Brusso cabinet hinges. A pair of 2” brass hinges are an astounding $46, for a very grand total of $276. For the hinges. Only the hinges. I paid $40 at an auction for the stack of extremely rough cut oak boards being used. Even “reasonable” priced hinges from various woodworking shops were still going to set me back over $100. So, cheap wood, cheap hinges. A pair of 2 ½” brass hinges from my local home improvement center were $4, costing a modest $24 for all needed. Yes, I will not be taking this bookcase on any expedition to India. I won’t be folding it either, at least all the way. The authors directions were detailed and accurate, with solid diagrams and photographs. Such help, though, didn’t prevent a slight layout mistake FOR THE LAST HINGE. It was my mistake, and as Chris so wisely surmised, if you make a mistake on ANY hinge mortise, it won’t fold flat. Kinda of a bummer. I’d say there was some confusion with the first steps on installing the hinges on the uprights. His process was to install four of the hinges, then remove them, cut the shelf dados, then put the hinges back in. 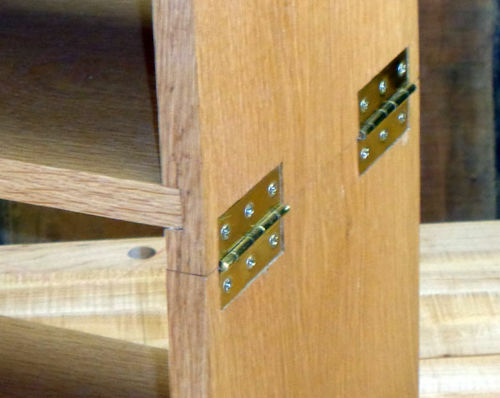 Would have made better sense to just layout the hinges, measure and cut the dados, then install the hinges. And somehow I didn’t fully comprehend how small it was, or how unlikely it was to store books on it. Really turned out to be a folding display shelf. If I ever work up the nerve I’ll try out the travelling bookcase, a stunning folding clamshell like case with adjustable shelves and dovetailed drawers. And only two hinges. Campaign Furniture is published by Lost Art Press, and as I mentioned in another Lost Art Press book reviewed on my website, The Essential Woodworker, this small publication company puts out outstanding quality books. Every detail shows craftsmanship, providing the reader a book that will last, and be enjoyed, for many years to come. Campaign Furniture is a complete and fascinating exploration of a unique style of furniture; Christopher Schwarz shows that even if you can’t take it all with you, you can still look good trying. This is a book I really want on my shelf. I’ve got a desire to build one of those leather arm chairs. I saw the one Roy Underhill’s show. It looked so cool and I could make fit my height. Another project on my to do list. This is one of my favourite woodworking books, definitely inspiring me to build more and better furniture. The brass pieces definitely raise the cost considerably. What was the mistake you made? If I build this, I’d want to avoid it as well. I’m currently tackling a variation on the folding field desk, we’ll see how it turns out though! Very inspiritional post- thanks for sharing. Thanks for the review. Ordered one after reading. Should be here tomorrow.